NASA astronaut Christopher Cassidy gets his spacesuit checked prior to Thursday's launch to the International Space Station. Straps bind Cassidy's knees close to his chest, in the position he'll have to maintain during most of the six-hour trip. The speedier ride that three spacefliers are taking into orbit on Thursday will get them aboard the roomy International Space Station a lot sooner than on previous Soyuz space missions. It will lower the demand on expensive support teams back on Earth. But there's also an uncomfortable aspect to the shorter flight plan. That aspect has to do with the Russian-made emergency pressure suits that crew members wear for launch aboard the Soyuz spacecraft. In the past, spacefliers put on the suits several hours before launch, and wore them for about three hours in flight — long enough to perform the early rocket maneuvers. Then they took off the suits and put them away until docking, two days later. During most of the trip, the travelers could stretch out in the orbital module, a roomier area of the Soyuz spacecraft. The situation is different for NASA astronaut Chris Cassidy and Russian cosmonauts Alexander Misurkin and Pavel Vinogradov, the newest crew members to head for the space station. Their trip is taking six hours rather than two days, thanks to a more exacting strategy for orbital navigation. The Soyuz launch from Russia's Baikonur Cosmodrome in Kazakhstan is scheduled for 4:43 p.m. ET, and arrival at the station is set for 10:31 p.m. ET. Mike Suffredini, NASA's space station manager, said the flight plan has the benefit of reducing the "amount of time the crew has to spend in a small environment before they get to the ISS." But that six-hour trip will be more intense. The trio will be wearing their Sokol pressure suits as an essential safety measure, to ensure against the kind of catastrophe that killed three unprotected cosmonauts in 1971 when their cabin suffered an air leak. But the suits are notoriously uncomfortable: They're designed to fit snugly into the tight crew seats, where knees are shoved halfway up to the chest. Arm mobility is restricted to being able to hold a stick to poke critical controls. Oxygen is fed into the suits via short hoses from a nearby console. 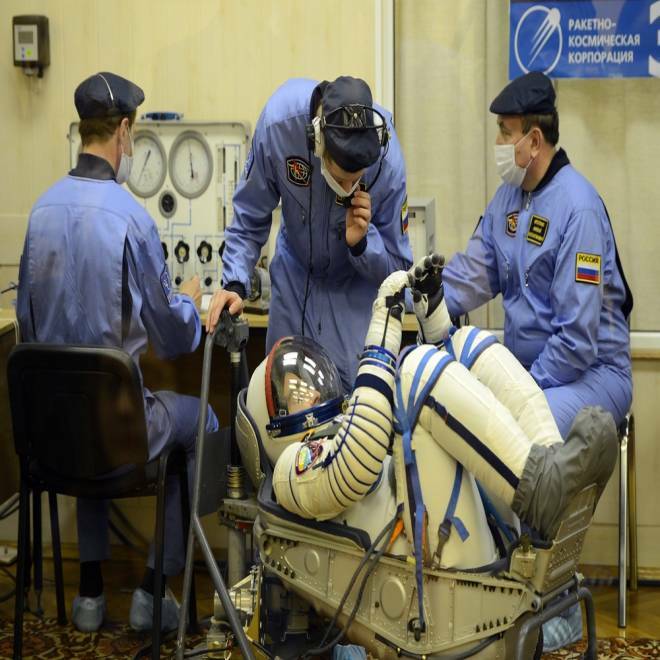 It takes hours to remove the suits and clean them, and at least an hour to put them back on and verify pressurization. There's not time for all that during a six-hour trip. As a result, the crew members will have to wear the suits for a much longer period that begins before launch and doesn't end until after docking. "They are definitely going to have to go to a very tolerant mental system to do this," one former NASA astronaut told NBC News. The spaceflier, who has experience with Soyuz hardware and the Sokol spacesuit, spoke on condition of anonymity because he wasn't authorized to speak out publicly. "My first thought was, 'Oh my God, how will they do this!!!" the astronaut said in an email. "If they let the confined/claustrophobic feeling in, it can escalate quickly. If they do not get excellent cooling, which is hard to get, curled up in the seat, it could be very bad. At best this will be terribly uncomfortable to say the least, and I would expect worse, especially given that Cassidy is pretty tall. ... My personal thinking is that this is going too far and even if they get through it this time, I would not think it reasonable as a general technique." Cassidy told CollectSpace's Robert Pearlman in an interview that he could tolerate the trip. "I'm a little bit taller than is comfortably seated in the Soyuz” Cassidy acknowledged, but he said he and his crewmates planned to ease out of their seats and straighten their legs while continuing to wear their spacesuits. "After a couple of hours strapped into that seat tightly, it is really, really nice to stretch your legs out," he explained. Several retired astronauts seconded Cassidy's view. "I don't really remember suit comfort being a big deal on my flight," Ed Lu, who was the first American to ride a Soyuz to the space station after the 2003 Columbia disaster, told NBC News via email. "We were out of our suits after 2 revs [revolutions], so what we are talking about here is just an additional 2 revs." Leroy Chiao, who rode a Soyuz to orbit and back in 2004, agreed in an email: “While the position one is required to be in for being strapped in the seat is not comfortable, I would opt for day-1 rendezvous. Once in orbit, the crew can loosen their straps a bit and move their legs a little. Shifting around helps relieve some of the discomfort." Cassidy told CollectSpace that the Russians found a way for crew members to relieve themselves while still inside the suits. "We wind up being in the vehicle for a very, very long time, and people just need to use the toilet eventually," he said, "so we'll open the hatch and have access to the [orbital module] and be allowed to take our suits not completely off, but enough to do any business we need to take care of." The nature of this "relief tube" remains obscure. Although cosmonauts are often photographed posing in front of their transfer bus for a re-enactment of Soviet space pioneer Yuri Gagarin's "peeing on the tires" ceremony, it's hard to see how they are actually attaining access to allow for urination. Demonstration videos of cosmonauts donning Sokol suits in orbit show clear views of the crotch area, and no openings are visible in the appropriate anatomical regions. Olsen described the only available method for such relief that he ever was offered. "We all wear 'Huggie' diapers and most have peed at least once shortly after launch,” he said. "The Russians give everyone enemas, so that's not an issue, even for the two-day flight, in most cases." Perhaps the long stretch in a spacesuit will bring the full truth to light: How do you get relief in orbit? "There is a 'big appendix' in the envelope (for the spacesuit donning) and a 'small appendix' in the lower part (for urination). The 'appendices' are made of rubberized cotton fabric and are pressurized by means of two rubber tight plaits. ... In the 'small appendix' area there is a physiological opening in the shell which is secured by lacing it up and covered by a fabric flap with Velcro fastener." NBC News space analyst James Oberg spent 22 years at NASA Mission Control, where he carried the title of Rendezvous Guidance and Procedures Officer — RGPO, pronounced "Arr-Jeep-O." In that capacity he sat in the center of Mission Control's front row, down in the legendary "trench" of space maneuvering specialists.